Here's the other part of my January. I made 27 sketches/drawings in 31 days. Here are 25 of them- there are just two that I did. not. want. to. share. I really enjoyed the exercise- it's been a very long time since I sat down to draw on a regular basis. I was really inspired by several different artists - not to copy them, but at how they see the world around them. Renee Gardner of Wolfie and the Sneak makes the most lovely botanical art. I treated myself to several of her pieces over the holidays and have them in the studio, over my drafting table. I love strong line of Nikki McClure's papercuts. There are lots of people who make wonderful drawings, and these are just two who have inspired me. I'm looking forward to February's work. The paper changes color to a creamy yellow. I might pull out some colored pencils and watercolors for those. this morning I got up early to head to the farmers market and take a little photography field trip. A friend sent me a link to a story about tableware taken directly from the earth. I did that once and enjoyed it, but haven't tried working with it again. On the way back from the market I heard an interview with Edward Tufte and his Buddha with Bird Nest sculpture. Sculpture might be the way to take this local clay- its high iron content contaminates my white porcelaineous stoneware too much for tableware. A seed (or nest) of Buddha with a nest has been planted in my brain. Canning season starts for me this week. I bought all the beets one farmer had- spiced pickled beets (and chiffonade of beet greens for the freezer- I love beet greens, especially sauteed with onion, garlic, and potatoes and served with hash or a bit of sausage-makes it palatable for the boys- over pasta) coming up- and was given a box of slightly smooshed peaches by the manager of an orchard who gave me tons of culled fruit for canning and drying last year. So sweet of him to remember! I'm thinking about gingered peach jam for this first box, and I'll get out the dehydrator for the less-smooshed pieces. The kitchen garden I occasionally sneak into (it isn't open to the public, but I've been given permission to visit, even though it stays locked) was lovely. Photos over at flickr. The Cathedral is doing a special project for Stations of the Cross during Lent. Each station serves as a springboard for a creative Cathedral member- we have painters, photographers, potters (who, I wonder? ), and just plain inspired, creative people- to create a work of art based on that particular station. I chose Station IV, Jesus meets his mother. Clay, india ink, gold leaf, cigar box, paint. I'm almost finished, which is good as it is due Wednesday. I'm feeling much better. Thank you for all of your kind thoughts. y'all know I love bees, right? I love them so much that I'll go out and rub the fuzzy tops of drunk/sleepy/cold stunned bumble bees (they wouldn't really sting, anyway). I just adore this bee. My good friend April is married to one of the most talented craftsmen I've ever met. Doug, in turn, has become a friend. He MADE this honeybee for me. Yes, really. 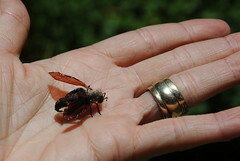 He got really into realistic fly-tying a year or so ago and started making the most incredible, realistic bugs. Doug recently opened an Etsy shop and a blog documenting his finished pieces and his creative process. Right now there's a honeybee drawing post that makes me swoon. Each bug is built around a fishing hook, which is perfect if you plan to mount a bug in a shadowbox, as I have. I could also see a dragonfly becoming a spectacular piece of jewelry. . . . I hope you'll all go check his amazing work out. I've learned so much about bugs from following his blog- I've always loved them, but now I'm actively learning about their names, sizes, and habits. I found out today that two sisters have begun a blog around two of my egg vases. I am both flattered and delighted that my work can showcase their creativity and strengthen their bond. And very interested to see what they'll put in the little vases. We've gotten a little break in the weather this week, so I'll be firing my kiln tonight and glazing this week. YAY!!! I just had to share something that came in my mail today. My friend Sarah sent this to me. I was anxiously looking for another package today but was sufficiently distracted by this warm and woolly nest and egg to forget it and everything else. I sat at my kitchen table petting it, marveling at the colors and texture, wondering if some of the wool might have come from Sarah's own sheep. 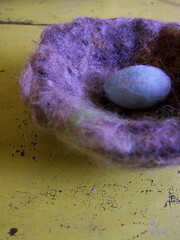 Sarah makes lovely felted bags, scarves, and necklaces that she offers over at smashing darling. I saw a photo of these on her flickr stream and was smitten. What a sweet friend to send me one of these and feed my bird-love. Thank you so, so much Sarah. I love it. I've been having fun with the echoes group on flickr. I don't post every day, but I do try to create a little something in a special little sketchbook every day. This is my entry for today. Early this afternoon we went to the mid-week farmers market and were happy to find honeycomb for sale. Our favorite honey people "grow" organic honey, and little boy has been asking about honeycomb since sometime in May. We bought some opened it as soon as we got home. He was so surprised by the texture and has been clamoring for more. But still, honey is sugar, and one big hunk of honeycomb a day is more than enough for any little going-on-five year old. I haven't had any since I was a child- and I'm thinking about saving the wax for some apothecary-type crafting. Finally, the finished icon. I brought it home on July 9, but our scanner was acting up so much, and not printing properly, either, that we broke down and bought a new one. It scans beautifully! This is reverse-painted on glass. The white highlights and black lines were the first things to go down. The solid backgrounds were the last, then after they dried, the gold leaf went on. The image is reversed, but that doesn't matter much to me. 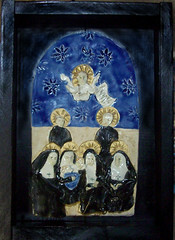 I'm pleased with it, even though I erased one of the nun's faces with too-wet paint. If I ever did this style again (I might), the image will be much much more simple. 'Cause this was HARD. But worth it. These ladies seem to be watching over me. When I made this as a gift for our former priest, I never dreamed I'd see it again or that anything would happen because of it. I was thrilled when it was included in a local exhibit of icons, even more excited when there was a class offered on icon-writing with the exhibit. This week, these ladies and that exhibit started to make things happen. 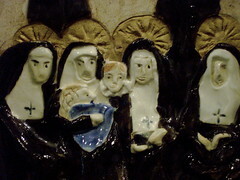 I got an email from a female priest on Monday, telling me that she'd seen the exhibit and my rendition of the Sisters of St. Mary's that morning. She is organizing a festive conference in September and wants to use the image for the poster. I'm not sure if the poster will be for sale, but I know that it will go up at each episcopal church in the diocese. We spoke on the phone for quite a long time, looked at my flickr images together, and both got even more excited about the sisters. 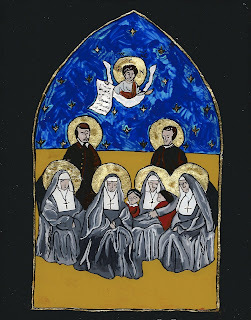 An bit later, I got another email requesting a similar icon for St. Mary's school, where the sisters taught. I got back in touch with Tobias Haller, BSG, who is a gracious man and is as excited about the spread of the "cult of the Martyrs of Memphis" as we were. By Tuesday, I had orders for two large icons to go to the school and to St. Mary's convent, in Sewanee, TN (it was originally a convent for the Episcopal nuns and is now a conference and retreat center). The line drawing/tracing I used for my glass icon may be on the program for the event, and I'm working on a stencil to make smaller, simplified copies of this image. I am astounded at how quickly this all seemed to fall into place, and grateful. Grateful to Br. Haller for his generosity in using this image, grateful to our friend for allowing this icon to be exhibited, grateful to these two priests who were moved by the icon, and grateful to the Sisters for their selfless sacrifice and inspiration. And I am one busy girl, because this all needs to be done by the first of September! I'm still working on these, too, and plan to have a batch finished by the end of next week. Keeping my hands in clay these days, grateful for the work. Happy weekend, everyone. Last night* was my first night of a three-session icon class. 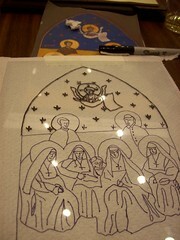 It is a Romanian Icon, which is reverse painting on glass. It was advertised as easy, as in, "if you can draw a crooked line, you can do this." Ahem. I beg to disagree. My table, which held me, a person fairly comfortable with painting fine details (all those ferns and ladybugs? ), a fireman (my boy was so jealous! ), a gallery manager, and a retiree, well, we all struggled. Everyone there struggled. I quit at this point- after two hours of work. The first step was to trace your design's outline ( I brought my paper copy of the Martyrs of Memphis) on glass with a sharpie. No problem. 15 minutes. Then came the painting the reverse of that outline on the glass. This is where the problems came in. Our instructor said that the paint needed to be "thin." No problem. I can do thin, I do thin with a 3-bristled brush and thinned black underglaze to make my ladybug details. It was too thin. The paint is supposed to be as thick as ink, thick enough to make a wall to hold in a layer of paint. Mine was watercolor thin. I think I spent 20 minutes working on getting the consistency right, then keeping it right (because the water evaporated quickly in the super-air-conditioned room). I brought the piece home with me to work on after my sale. I won't have time this week- it will be a glazing, cleaning, and re-arranging fiesta at casa Bridgman, but we don't meet again until June 22, so hopefully I will have time next week. Interestingly, all of the other designs available were very detailed- mine is very simplified from the original icon. It is also the reverse image, but oh well. I'm not perfect. Neither is it. *last night the dove came back- I've seen him around, but he was hanging out in the tree house WITH the boys. While they were hammering. Then eating from both of their hands. Pretty magical. But this is someone's pet, so we put an ad in the paper today. But man, oh, man, I'd like to hold the dove again! This just in- the wonderful priest who owns this icon has lent it to St. George's Episcopal Church gallery in Germantown, TN for an exhibit of icons, featuring the work of Mary Jane Miler of San Miguel de Allende, Mexico. I am so tickled that my icon will be included! The opening was last night- I was unable to attend, but I'm going to get out to see it. The exhibit is up until the end of July. I'm particularly excited about the icon writing class that's going to be on Sunday nights in June, starting this Sunday. This particular technique is reverse-painting on glass, a Romanian form, I believe (I could be so so wrong). I've wanted to take the traditional egg-tempera icon workshops for years, but they are pricey. At $75, this class is certainly affordable. It starts this Sunday, so I'm sure I'll have photos to show you as it progresses. This morning after my run* I opened my blogroll and clicked on Loobylu, where I saw "archive friday," where she showcased some of her older work. While I've unofficially been revisiting some of my older work, I thought follow her lead and delve into my sketchbook today. This little image, drawn with a superfine pen on crepe paper (I think) and glued to a small white card, was the basis for my 2004 Christmas card. The bird was not so hard, but the nest was trying. I don't think you can tell, but I drew them separately and layered the images. When I was happy with the image, I did nothing more than take it to kinko's to have it printed and sent them out as postcards. I made my own christmas cards for years and years. Every year I consider buying cards and every year I bail on that idea. This year I embellished plain cards with snowflake cutouts. Sorry, off topic. This little bird theme keeps showing up in my pottery. Hopefully, after the kiln cools (now, at 8 am, 12 hours after firing ended, everything is still too hot to touch), I'll be able to show you more little birds in my work! *This is strange. This has always happened, and maybe other runners can explain it. I ran more distance today than Weds, which was more than Monday- breaking in the new shoes slowly. This morning I ran all the way around an additional block (yeah, sounds wimpy, I ran an extra block, but our neighborhood blocks are about 20 houses long, then skinny just-backyards on the other sides), plus my usual takes-30-minutes route. I got in the door and was shocked (SHOCKED, I tell you) to see that it took less time today than it did the rest of the week. What gives? Anybody know? I don't think I'm running faster- I did run more, but. . . .
Little boy had lots to do when he went back to school on Thursday. Evergreen Playschool is a 6mo-kindergarten play-based preschool that mixes the best parts of montessori, reggio-emilio, and play-based education. I've been pretty astounded at what they've done, but this time, it was his turn to surprise them. This week his class had made a large garden and posted it up on the wall. Each child was to draw a flower, or several flowers, to add to the garden. My boy has been listening to my "greenie mama" ramblings about pollination, bees, and ecological diversity. The first thing he drew was the "garden fly." This is an entirely different thing from a house fly*. Those are yucky. Then he drew the grass, because a garden is not just flowers. There is lots of grass in the garden. Lastly, he drew the tiny blue flower, because blue is almost always our favorite color- mine and the boy's, so we have a fairly large collection of blue-flowering plants in our garden. His teachers were surprised at both the detail he put into his work and at the overall picture he presented of the garden, that it's not just the flowers that make up the garden, but that it is an entire system. I am always surprised at how he internalizes (in the good way!) what I say, even when it seems like he's not listening at all. I'm delighted that the things that are important to me- the good green earth, our responsibility to preserve it as best we can, and, of course, creative expression- are sticking! *We have a trap we got from here so that they don't swarm the house. The falling figs in the summer attract swarms of flies, plus, well, they are attracted to dogs. The other day we were in the car and he said, "look, mama, there's a giant blue flytrap!" It was a small screened-in trampoline in someone's backyard. The fly trap that we use is recommended by the World Health Organization for disease prevention. Photoshop credits go to Gary Bridgman. He does things with a computer I could only ever dream of accomplishing. Thanks, Honey! I mentioned in my Mardi Gras post that I was taking on gratitude as a lenten discipline. The transforming power of gratitude on one's outlook on life is amazing. Of course, this fine, fine February day helps with a sunny outlook. After running errands this morning (which included picking up some easy to grow seeds for my boy and his mini-swap partner and a happy-valentines-to-me gift of a two raspberry plants- one golden! ), I opened the windows to let fresh air into the house, put my new white hyacinth into a bright blue cache pot, and enjoyed the fruits of a quickie-rearrange project Gary and I worked up last night( it included a new "desk" area for little boy in the kitchen, up on flickr later). I love living in Memphis- our winters are mild- I can keep arugula and herbs going year -round. Today is a beautiful day to get out and work in the garden. I love having a morning to myself. I love my museum job, even though it meant that most of my work in the studio this week was of the clean-up and rearrange type, and I love my home-job, because it provides me with a greater sense of self and an (paying! )outlet for my creative impulses. The photo shows some of Gary's creativity. He makes shot-sign art- lighted pieces that typically have his fabulous photos on slide film behind each bullet hole. The "garden" sign came from a huge Liberal/Garden City Kansas highway sign. I claimed the Garden part before he could do anything else with it. He is such a nice guy, he just let me have it to hang up on our front porch. In "art", "everyday pottery", "living"